The office of the botanical research station of the Center for Cacao Research, a farmer’s cooperative outside Porto Seguro, Brazil, is a small, whitewashed and mud-spattered cinder block house with bare tile floors and a poster on the wall that welcomes visitors with a helpful hint: “If bitten, go straight to hospital. Remember to take the snake with you for identification.” The five visitors who paused in front of this placard on a balmy midwinter morning in June 2002, though not wearing the rubber boots highly recommended by another poster “to prevent accidents with snakes,” were undeterred. They had come a long way, two of them from as far as Germany, and there was something on the grounds they wished to see. Led by the center’s director, José Roberto de Melo, the men ambled up the wide dirt drive past a row of greenhouses and through a grassy field dotted with spreading trees, and then down a fire road into the forest. Soon, even that avenue gave out, and the men struck off through the brush single file along a winding and barely discernible trail. Two of the cooperative’s workers took up the lead, wielding machetes and wearing regulation high rubber boots, and another brought up the rear, alert for predators and, of course, cobras. To enter a Brazilian rain forest is to trade one sensory realm for another. The trees close in high above and a twilight descends on the forest floor, and the world of sight quickly gives way to one of sound. The effect is eerily like the dimming of house lights in a concert hall in the moments before the musicians begin to play. As the men walked, the swooshing of vegetation threw a whispering shadow around their steps and the echoing chatter of parakeets and the call of crickets sparkled like stars in a firmament. When the men had spent most of an hour on the trail, de Melo stopped and laid his hand proudly against the trunk of a large tree. “Here,” he proclaimed. “Do you recognize it?” To the untrained eye, the tree’s gray-splotched bark seemed little different from that of myriad other trees the group had passed, and its lowest identifying leaves were lost in the stratosphere of the canopy. But the visitors did indeed recognize the tree immediately: an especially large and old specimen of Caesalpinia echinata, known commonly as pernambuco or pau-brasil. The visitors had an intimate connection with this species. They were archetiers, craftsmen who make bows for violins, violas, cellos and basses, and wood from the pernambuco tree is the only known material, synthetic or natural, out of which a bow maker can construct a top-quality, performance level bow. For centuries, trees like this one had been harvested from the Brazilian forest and shipped to Europe and North America to be turned into bows. These particular bow makers, though, had not come to harvest the tree. They’d come to save it. Pau-brasil is today becoming scarce, so scarce that wood dealers must trek deep into the forest, just as these men had done, to find the remaining mature specimens. So scarce that international organizations have been debating measures to restrict the wood’s use worldwide. And so scarce that bow makers from around the world have mobilized, starting an organization called the International Pernambuco Conservation Initiative (IPCI), with the mission of rescuing the species. In the process, they hope also to rescue their profession. Jostling through the underbrush, the bow makers gathered around the old trunk like siblings posing at a family reunion, and a camera flash thundered through the twilight. The bow is the Cinderella of the orchestra, the overworked and overshadowed helpmate of its more glamorous partners. Few people, even among lovers of classical music, think of the bow as an instrument in its own right, but players of stringed instruments know better. “Some people think a bow is only wood and hair,” says Günter Seifert, violinist with the Vienna Philharmonic and head of the Wiener Geigen Quartet. “But the bow can be more essential to expressing the soul of the music than the violin is.” For this reason, pernambuco bows are used by almost all serious orchestral and chamber musicians, whether they be professionals or amateurs, and by most advancing students, who learn early in their education that “it’s better to have a fine bow and a mediocre violin than a fine violin and a mediocre bow.” Seifert notes that some virtuosos often play on a range of instruments but insist on a single favored bow. Other players might quibble with such claims, though their qualifying tends to reinforce the rule. “People who say that the bow is more important than the instrument, this I don’t believe,” says cello virtuoso Heinrich Schiff. “Sometimes you depend on the bow more than the cello. Sometimes it’s the other way around.” This from a man whose cellos are Antonio Stradivari’s 1711 “Mara” and Domenico Montagnana’s 1739 “Sleeping Beauty,” two of the most revered instruments in the world. On November 24, 2002, Schiff lugged his Sleeping Beauty onto the stage of the venerable Konzerthaus in Vienna to play a Bach suite and other selections in a concert that also featured the Wiener Geigen Quartet and Triology. The Konzerthaus is one of the preeminent domains in the music world, and the night’s performers were among that world’s celebrities, but the declared stars of the evening were the pernambuco bows the performers were using. Seifert debuted his composition “The Pernambuco Waltz,” and before the intermission, the lights stayed low and taped calls of Brazilian jungle birds filled the hall as an image flashed on a screen over the stage: a photograph of the five men posing beside a pau-brasil tree in a forest half a world away. Klaus Grünke, 46, is one of IPCI’s founders. He lives in Bubenreuth, Germany, a small village north of Nuremberg that is a center of instrument making. His shop is a clean, functional space, heated with a wood stove and lit with north-facing windows. A profusion of chisels, planes and knives inhabits the workbenches, and a basement storeroom holds a cache of seasoning pernambuco wood, already cut into bow sticks. As befits the atelier of a traditional craftsman, the Grünke shop is multigenerational; Klaus’ father, Richard, and his brother, Thomas, work at adjacent benches. Atoy bench sits between them, scaled to the early efforts of Thomas’ 3-year-old son, Raphael, and 5-year-old daughter, Lilian. But the lineage is more than familial. An apprentice from Brazil also works there under Klaus’ tutelage, and former apprentices include Thomas Gerbeth, now a master maker in Vienna and the organizer of the November benefit in the Konzerthaus. Bow makers are far flung and work independently. But they share a common genealogy, going back more than 200 years to another atelier, set beside the Seine in Revolutionera Paris, where the modern instrument bow was invented by an artisan named François-Xavier Tourte. According to sketchy historical documentation, Tourte was a lifelong illiterate and an avid fisherman who brought skills to the bow trade he’d learned during his earlier apprenticeship as a clockmaker. There were bows before Tourte, of course— they’ve been applied to stringed instruments since the reign of the caliphs in Arabia in the seventh and eighth centuries, and those used during the Baroque period preceding Tourte’s time have many similarities with the modern bow. But Tourte compiled a series of innovations—most his own but some from others—into something new and powerful. His model was concave, with the wood bent into its shape over dry heat in a process called cambering. It had a higher head than earlier bows, to hold the horsehair away from the stick; a ferrule, or metal ring, to press the hair into an even, flat band; and a screw mechanism to draw it to the desired tension for playing. Most important, Tourte standardized every measurement of the bow, determining the optimum dimensions and weights, the logarithmic curve and precise taper of the stick. 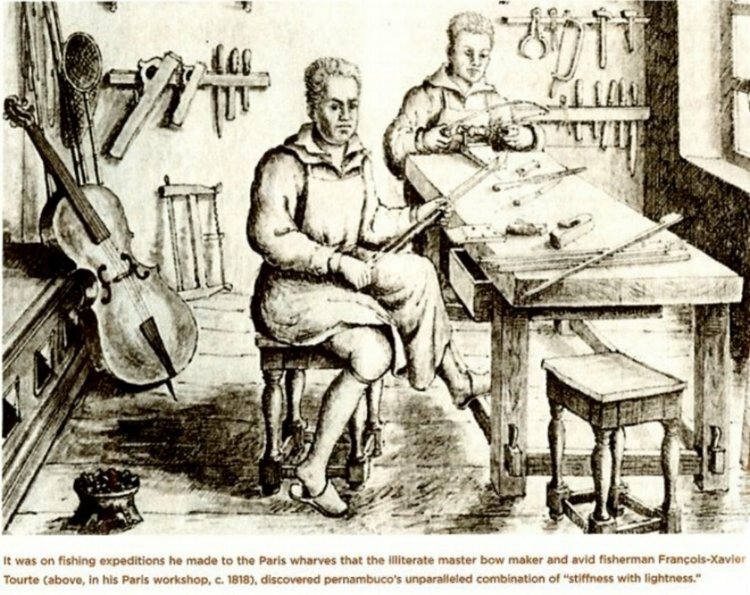 His invention earned him the honorable nickname Stradivari of the Bow. Many string players consider that faint praise. In concert, the delicate interplay of materials, strength, resilience and balance that Tourte worked out gives performers a magical tool, allowing them to both dance and dig, to execute delicate and difficult phrasing, bouncing off the string with a strong attack in one place and, in another, settling into the string to draw the sound out of the instrument’s belly. That sound emanates in part from the bow, for in addition to its acrobatic talents, the bow resonates. Its frequencies interact with the instrument’s own to create a distinctive tone. (“It’s 50 percent of your sound,” Jopling says.) This constellation of virtues spurred Giovanni Battista Viotti, the 18thcentury violin virtuoso who is rumored to have consulted with Tourte on the bow’s formulation, to declare: “Le violon, c’est l’archet”—“the violin, it is the bow.” The bow is so crucial that much of the music of Beethoven, Brahms and Schubert and their musical heirs would not be performable without it, at least not in a way we’re used to hearing. “For modern techniques, the modern bow is required,” says Rudolf Hopfner, director of the instrument collection in Vienna’s Kunsthistorische Museum. He presides over an extensive collection of wind, keyboard and stringed instruments there, and of bows, including those of the Baroque and modern periods as well as the “transitional period” that fell between them and ended with the advent of Tourte. “The Baroque bow is superior to the modern bow for the music of its time,” he says. “But if you think of Paganini and all the tricks of his day, you couldn’t get that bounce and ricochet with the Baroque bow. Just as you can’t play the chords of Brahms or Sibelius with a transitional bow. Their music has a drama and power that can only be achieved with a Tourte.” Fine bows are among the last few non-ornamental items in Western life produced by hand by an individual, not out of nostalgia but because that remains the best and fastest way to produce them. Bow makers work today very much as Tourte worked, with tools and techniques passed from master to apprentice through the generations. The apprenticeship is as arduous as the bow’s standards are rigorous, and only a relative handful of craftspeople ever become master makers. In addition to reinventing the bow, Tourte may be said to have established the working standards for a nascent profession. Just as his bow has come down through two centuries without significant alteration, so, too, has the job of the archetier. Those centuries may be coming to a close. On an early Sunday morning in the fall of 2001, a year before the Vienna concert, Klaus Grünke and Josef Gabriel, a fellow bow maker from Germany, stood in a light rain outside the locked doorway of a Beaux-Arts building near the Parc Monceau in Paris, waiting tensely. Soon, other bow makers began arriving, greeting each other in French and Spanish and English and German and Portuguese. Someone produced a key to the building, and the group filed upstairs to take seats around an enormous boardroom table. The table belonged to Comurnat, an organization that forges a vital link between the conservation of wild species and their commercial use by enlisting craftspeople into the cause of the materials they depend on. Comurnat’s founder and director, Marco Ciambelli, has an intimate understanding of the plight of such craftspeople— his family had been tortoiseshell workers in Italy and France for generations before the material was restricted in 1989 to protect the sea turtle, which caused the atelier Ciambelli gradually to collapse. Through that business, and even before he started Comurnat, Ciambelli was acquainted with bow makers; for centuries they had used tortoiseshell in some of their finest bows. 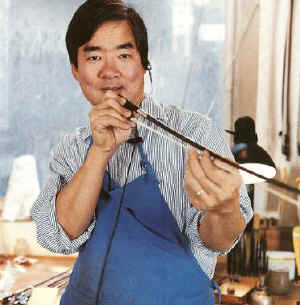 In the fall of 1999, he met with a small group of French bow makers in a Montparnasse café to relay a concern. He had learned that CITES—the Convention on International Trade in Endangered Species of Wild Fauna and Flora—might soon consider listing pernambuco on one of its appendices. CITES puts the weight of international law enforcement behind the conservation of plants and animals by regulating their international trade. Placing any species on the most severe of its three appendices would make its commercial use as restricted as that of ivory and tortoiseshell. Ciambelli strongly suggested to the bow makers that, given the risk to their profession, they should organize and find concrete ways to advance the conservation of pau-brasil. The result was the conservation initiative, IPCI. Before the conversation in the café, the profession had been sailing along peacefully with little warning that an iceberg lay in its path. Bow making was in fact enjoying a renaissance, after the damage inflicted by the upheaval of two world wars. The wars had fractured the old European bow-making dynasties, whose secrets were in danger of being lost forever. Since the 1980s, though, a new generation of archetiers has rescued that knowledge by apprenticing itself to the last of the oldtime masters. The younger men and women have since mentored each other and set about producing some of the best bows ever made. New bow-making centers have sprung up in villages where nothing of the sort existed before the wars: Bubenreuth, Germany, and Domingos Martins and Guarana, in Brazil. Port Townsend, Washington, a seaside town on the Olympic Peninsula, has by happenstance become (along with nearby islands) the home of Charles Espey, Paul Siefried, Ole Kanestrom, Chris English, Morgan Anderson, Peg Baumgartel, Robert Morrow and enough other legends and strivers in the trade to make it the undisputed center of American bow manufacture. Tourte didn’t have to go to those extremes, though he conducted quite a search to find the perfect wood. It is said he combined his fishing trips along the Seine with visits to Russ Rymer, recipient of a Guggenheim Fellowship, is at work on his book Out of Pernambuco (Houghton Mifflin), due out in 2005. the wharves, where he scavenged slats from New World packing crates and the staves of sugar barrels with which to experiment. Only pernambuco displayed the proper range of beneficial properties: in addition to its springiness, density and strength, it was workable, readily adopting a curve when heated and holding the curve seemingly forever. The wood does have its drawbacks. It can be thorny and twisted, and is often too light or otherwise unsuitable for the manufacture of good bows. Substitutes have long been sought. An all-steel bow stick was tried in the mid-19th century, and, more recently, composite fiber bows have been produced to passable reviews, though they have yet to rival pernambuco in quality or popularity. 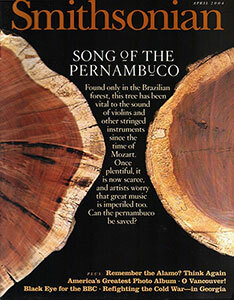 Pernambuco’s unreliability also made it expensive: one 19th-century expert maintained that one could go through eight to ten tons of pau-brasil to find the wood for a single, fine, 70- to 80-gram bow. Though that ratio has been improved dramatically by modern techniques, there still remains a lot of waste. Only a portion of even the best trees are suitable for fine bows, and woodcutters in the forests, unheedful of conservation and unschooled in craftspeople’s needs, have been known to fell tree after tree before finding one containing usable wood. Fortunately for bow makers of Tourte’s time, the wood was readily available in Europe whenever a war wasn’t disrupting maritime commerce. Its importation was owed to a red pigment that suffuses its grain (“pau-brasil” means “furnace- red wood” in Portuguese), which was extracted for dyeing the robes of nobility. The dye trade made pernambuco the main export from the Portuguese colony of Brazil in its early years, a distinction memorialized in nomenclature. Pau-brasil was not named after the colony; Brazil was named after the wood. In Tourte’s time, 168 acres of central Paris were piled head-high with pau-brasil logs. 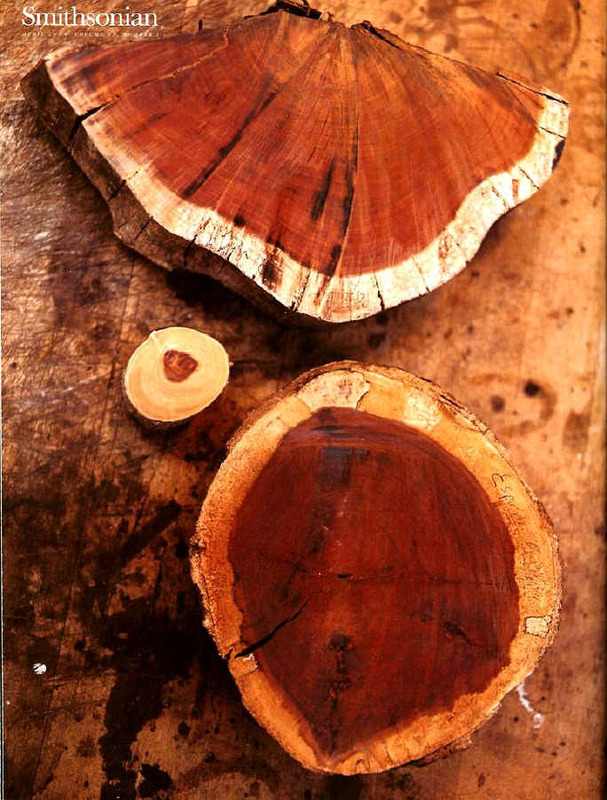 The trade in the wood collapsed after the invention of aniline dyes in the mid-1800s, leaving bow making the only international industry still reliant on the pau-brasil tree. That reliance was small compared with the volumes of wood that had been needed to produce dyes, but it was big enough to confer an inescapable responsibility on bow makers. Even if they used relatively little wood, the wood they were using was rapidly disappearing. Contemporary bow makers are determined not to become villains in a similar extinction drama. Soon after IPCI began deliberating over a response to the pernambuco crisis, its members turned their attention to more basic matters than the effect of a CITES listing on their careers. They began worrying about the fate of the tree itself. Pau-brasil grows in a particular Brazilian habitat known as the Mata Atlantica, the forests of the coastal plain. Those forests were once lush, with dozens of species of trees, and seemingly endless, stretching uninterrupted southward from the mouth of the Amazon to the Argentine border. Today the forests exist only in tiny isolated fragments. They were plundered in the 16th century to supply world markets with woods like mahogany and pernambuco, and portions were leveled for sugar cane plantations, but the destruction has vastly accelerated since World War II with the building of highways and the intensification of development. The trees are burned for charcoal to supply the country’s steel mills, and cut down by farmers clearing fields for beans and by big farming conglomerates creating pastures for beef cattle. In the states of Espírito Santo and southern Bahia, square mile after square mile of forest has been replaced with regimental rows of fast growing eucalyptus to feed a giant pulp mill at Aracruz. They still are not vacationing there, but they are coming more frequently, and with a grander mission. Slowly, IPCI is building a hard-fought success on the ground. The group began, in 2001, by digging wells and installing irrigation systems to help save 100,000 pernambuco seedlings threatened by drought in a Recife nursery, and inviting such authorities as Haroldo Calvacante de Lima, director of the Rio de Janeiro Botanical Garden, to Paris to consult with IPCI on growing pau-brasil. The trees’ needs are little understood. Despite pernambuco’s status as Brazil’s official national tree, and despite its long commercial history, its growing habits and preferred habitats are still mysterious. There is not even a scientific consensus on how many varieties and species of pau-brasil exist. To fill this knowledge gap, IPCI sought out the cacao farmer’s research concern and began to shape with it a program that includes population inventories and taxonomic studies. If all goes as planned, the studies, paid for by contributions from bow makers around the world, will culminate in the replanting of pau-brasil in the cacao habitats of Bahia state. Cacao, the source of chocolate, is a shade-loving plant; by coupling a pernambuco over story with the welfare of the cacao crop beneath it, the cacao research center’s botanists hope to provide farmers with an economic incentive for keeping the trees standing during the 30 years or so needed to produce usable wood. A quarter-century ago, wood dealer and bow maker Horst John recognized the need to replenish the dwindling stock of trees and began planting pernambuco on his property in Guarana. His effort has been expanded by Jacy Sousa, who has headed Horst John Bows since the founder’s death in November 1997, and is being replicated by Arcos Brazil and Waterviolet Bows, also in the Guarana area, and by Marco Raposo Bows farther south in Domingos Martins. Floriano Schaefer, who runs Arcos Brazil with Celso de Mello, has worked to salvage and use nonliving sources of pernambuco, such as dead logs lying on the forest floor. Those same bow makers have been spearheading IPCI’s efforts with the government, which require a native’s understanding of the Byzantine world of Brazilian law and politics, a territory less charted and fraught with greater peril than the country’s snake-infested forests. Federal and state laws already forbid the cutting of pernambuco under most circumstances, and the transportation or use of most of the wood. As a result, Brazilian bow companies have come under close inspection by the national ecological policing agency, which wants assurances that the companies’ wood stocks (and some of the wood they’ve sold to foreign bow makers) do not come from illegal sources. As the Brazilian makers labor to demonstrate that their suppliers are reputable, the IPCI bow makers must allay other suspicions. Brazilians have a fear, grounded in the hard lessons of their history, of the intentions of outsiders, who have traditionally come to extract the nation’s natural riches but not to help the country. IPCI bow makers have had to ensure that they are not merely putting an idealistic face on the same exploitation that supplied wood to their professional forebears for 200 years. The profound interconnection between a musical tool, a plant, an ecology, an economy, and a society and its history is a lesson of the forest. On the June day in 2002 when the visiting bow makers walked into the Mata Atlantica to find the old pau-brasil tree, José Roberto de Melo explained the significance of the plants they beheld: how this vine was sacred in the African religions transplanted to Brazil by the slave trade, how another had medicinal use. One of the cooperative’s workers cut a large leaf from a palmetto and held it up with a smile. “This is an instrument too,” he said, one that the aboriginal Indians had used to communicate over long distances. He hit the end of the stalk with the shank of his machete, and a loud, hollow bass note boomed through the forest. “Warning,” he translated. The IPCI bow makers are sounding a similar alarm: the future of a high art rests on the future of an imperiled tree.